Amid the Barolo vineyards of Piedmont’s Le Langhe, this fine castle was first constructed in 1142 by Marchese Del Carretto. There are, of course, the modern facilities one expects from a highly regarded hotel, but the sheer age and charm of the building has been allowed to shine through. The hotel offers a total of 18 guest rooms in all, each with its own historic feel. Of all, perhaps the Chapel and Loft Suites are the most notable, with the former set within the castle’s original chapel (as the name suggests). 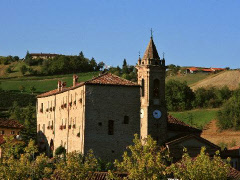 Sinio itself is often referred to as the “Village of Flowers”, while other celebrated little places such as Serralunga and Monforte d’Alba are close by. Those travelling by car will also find towns such as Bra, Fossano and Alba within easy reach. Castello di Sinio boasts its own restaurant and outdoor pool, and is certainly the sort of place that will appeal to those seeking to unwind as well as immerse themselves in history.